We have a new invest in the Southwest Indian Basin, 94S. JTWC currently is giving the system a medium chance of development in the next 24 hours. from 50 to 80E along 1S to 7S. The associated convective activity has now focussed only in the eastern part of the basin around a disturbance in pre-genesis stage east of the Chagos Archipelago. Over the western areas of the basin, deep convection present yesterday has nearly disappeared. The low level circulation described yesterday is not detected anymore on the ASCAT swath or satellite imagery. Over the east part of the basin, convective activity has increased quite significantly during the past 24h, around a surface low now defined. A closed low level circulation can be seen on this morning ASCAT swath and the 0720Z AMSR2 micro-wave imagery, around a center rather well defined near 7.0S/77.9E. At 12Z, the center was located near 7.8S/77.2E, meaning a movement to the south-west at 10kt. The MSLP is estimated around 1003hPa. The cloud organization is getting better, even if there is no CDO or curved bands well defined for now. According to the ASCAT data, the most intense winds are 20/25kt in the south-eastern quadrant in the maximal convergence area between the the transequatorial inflow and the trade winds. The high level divergence is good, with strong wind shear area north and south of the system in relation with the subtropical jet and the eastern equatorial jet. But the wind shear near the center is low to moderate (10/20kt CIMSS data). The Dvorak DT for the system is 2.0- at 12Z (tropical disturbance). The environmental conditions are rather conducive for a deepening in the next 48h. According to its current path, the system will encounter warmer waters south-east of the Chagos archipelago. The wind shear will stay low to moderate and the divergence still good. Several deterministic models forecast a less or more intense deepening after friday. the french model Arpege is the most reactive meanwhile CEP and UKMO suggest a slower cyclogenesis. The EPS product for cyclogenesis gives a 60% probability for a tropical storm developpement. But this figure is decreasing in comparison with yesterday. GFS do not forecast an important deepening. The system is expected to move southwestwards, before turning southwards where conditions will be less conducive after Sunday (south of 10S) with a stronger wind shear. The interval for a deepning is limited to the newt 48hours with a moderate intensity at its maximum. The likelihood of development of a tropical depression south of the Chagos Archipelago is moderate Friday and Saturday. Weakening forecasted beyond. The Southwestern Indian Ocean basin extends from the equator to 40S and from the african coastlines to 90E. Looks like this system is already a tropical storm. No ASCAT to confirm yet. It's at the very least a depression now. JTWC needs to put out a Tropical Cyclone Formation Alert for this ASAP. Don't know why they haven't yet honestly. THE CENTER AND ALSO WITHIN PERIPHERAL BANDS (MAINLY TO THE SOUTH). FAIRLY CONSISTENT AMONG THE AVAILABLE AGENCIES. MAXIMAL WINDS OF 25KT AND LOCALLY 30KT IN THE WESTERN SEMI-CIRCLE. THE AVAILABLE GUIDANCE AND THE AVERAGE TRACK OF UK-GFS-EURO OF 12Z. WOUNDED BANDING AROUND THE CENTER. SATURDAY AND BEYOND WITH A GRADUAL INCREASE IN FORWARD MOTION. TO GRADUALLY STRENGTHEN UP TO THE GREATER STAGE OF TROPICAL STORM. SYSTEM IS MOVING WEST-SOUTHWESTWARD AT 17 KNOTS. JTWC upgrades it to TC 03S at 12Z. For some reason not showing up on JTWC's website. 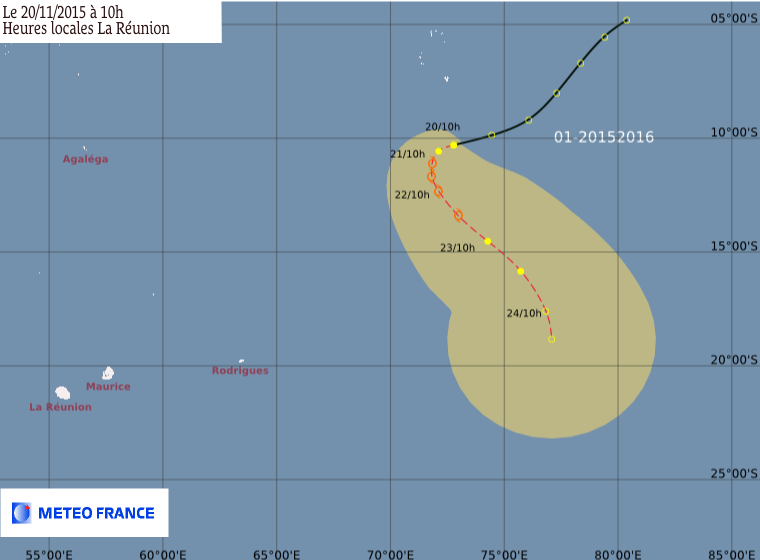 If RMSC La Réunion upgrades to TS strength, then the Mauritius weather service will assign the season's first name, Annabelle. 201500Z POSITION NEAR 10.0S 71.5E. 37, BUT LESS DEFINED IN 85. 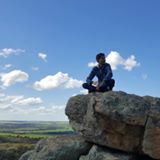 GRADUAL INCREASE IN FORWARD MOTION. How does the Meteo-France's numbering system work? I am unfamiliar with it. From the Tropical Cyclone Operational Plan for the South-West Indian Ocean, "in the South-West Indian Ocean, the cyclone season lasts from 1 July of year N to 30 June of year N+1." 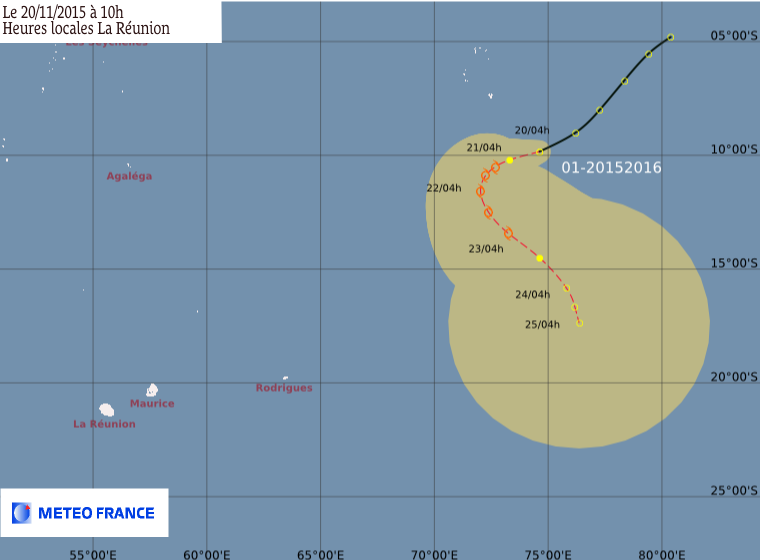 So when you look at lines 0 and 1 of the warning, it means that this is the first system for which RSMC La Réunion has issued warnings for the 2015-2016 cyclone season. Altogether, the system is similar to what NHC, JTWC, and CPHC do with numbering tropical depressions. Upgraded to Moderate Tropical Storm Annabelle. CENTER INTO A IRREGULAR CDO PATTERN, WITH A LARGE BANDE IN THE EAST. 210300Z POSITION NEAR 10.3S 70.5E. 211500Z POSITION NEAR 11.2S 71.6E. THE CURRENT SOUTH-SOUTHESTWARDS TRACK IS SLOW DURING THE LAST HOURS. TOWARDS A WEAKNESS IN THE PRESSURE FIELD TO THE SOUTH OF THE SYSTEM. RIDGE EXPECTED TO BUILD IN THE EAST-NORTH-EAST OF THE SYSTEM. SYSTEM TO SLIGHTLY STRENGTHEN OVER NIGHT. AHEAD OF A UPPER LEVEL TROUGH AND BECOME MODERATE TO STRONG.